I've taken to listening to audiobooks lately, and found a gem on Hoopla. Have you heard of the KonMari method of tidying? This book by Marie Kondo The Magic of Tidying is about decluttering and keeping only items that inspire and spark joy in you. Its a quick read or a quick listen, about four hours and you too will be motivated to declutter. The most important thing to figure out before you declutter is to determine your "Why?" by stating your reason you want to declutter and then asking Why. Do this three times to find the root cause of why you want to declutter. 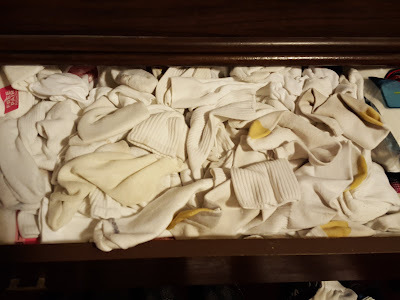 You will find it has nothing to do with getting rid of junk, but is probably a reason related to relationships or people or freedom or something. For me, I stated to my DH that I wanted to declutter the pool table rec room so we could play billiards again. It is currently surrounded by excess stockpile bottles of shampoo and bounce and boxes of napkins and toilet paper. On top are piles of items we dug through boxes to find but then did nothing with. The room is a mess. Anyway, my second level Why question is Why do I want to play pool? Well, its a hobby both my DH and I enjoy and we never do it anymore. Why? Well we used to play pool with friends on Friday nights and party, but now we hang around the backyard by the firepit and listen to music or watch some sporting event on TV. We have replaced billiards with hanging outside. Which is fine, but there are lots of times during the year when it is not very fun to hang around outside - like in July in Florida where we have gotten twenty inches of rain! Or in January when its near forty degrees which is cold even with the nice warm fire blazing. Anyway, I've announced I'm going to declutter and follow the method in the book which states to start with the most non personal items which are clothes. Several years ago when we remodeled our bedrooms. living room, and family rooms we purged bags and bags of clothes, books, mimentos and papers. However, a good majority of them just ended up in boxes in the rec room and our spare guest room. Our guest room has become our stockpile room and it is too a mess. We probably have over a thousand rolls of TP and a 50 rolls of paper towels, over 100 toothbrushes, 100 shampoos, dozens of bottles of cleaning products and every other personal care item you could need or want. We undoubtedly will have to have a garage sale coming up in the fall to get rid of all the excess I plan to discard. And it will be a good one. Once its outside the house for a yard sale, it will not be coming back in - to the curb it will go. 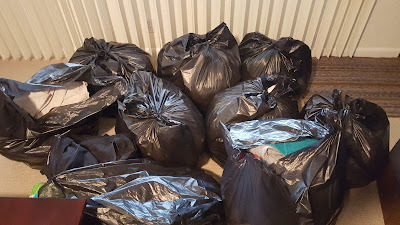 So, the process of tidying will begin with my clothes, since DH has declined to participate even though he has dresser drawers of clothing which he has not touched since we moved to Florida over twenty four years ago! Literally, he has not opened the drawers on these dressers for many years. I have graciously agreed to leave his stuff alone, but I secretly hope that he will be motivated by seeing all the stuff I will discard. I personally have over two hundred tshirts alone. 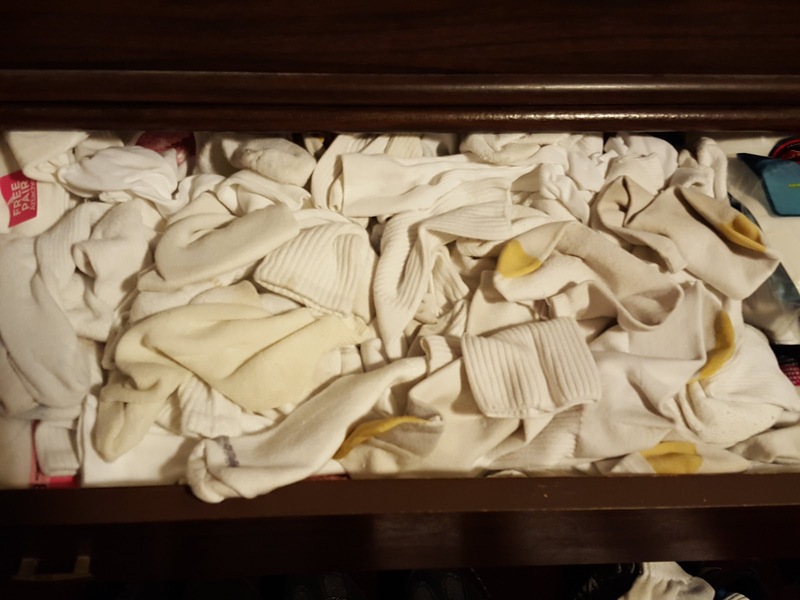 My drawers are overflowing with brand new pairs of socks, and underwear still in the cute little Victoria Secret package. That's another rule of the book, when you purchase something be sure to remove tags and packaging and properly fold it into the KonMari rectangle and find a place to vertically store it in a drawer or closet. Wow, I need to get remotivated. I wrote this post 6 months ago and actually did a purge of clothing, we got rid of a dozen garbage bags of clothes. But I felt very little joy from my clothing. I actually threw out too much and didn't have any of those old grungy tshirts to do lawnwork, or painting in. So, I dug out some of my favorites that I had tossed and put some shirts on my shelf. I also didn't continue to other items beyond clothing. I'll have to start over and read the book again because I do have too much clutter. If you're feeling to love and want to declutter, another blogger is having a challenge in January to declutter with a nifty calendar plan, check it out at Simply Stacie. The calendar is a printable pdf so you can print it out and hang it up to follow all month. 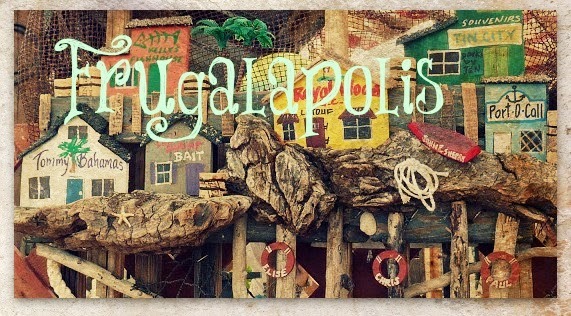 I haven't posted for a while but plan to get back at it and bring Frugalapolis back to life. I've still been couponing and saving money on groceries and household supplies. Of course with the changes in policies the last few years it is harder to find the deals, and then even harder to find the products in the store, but its still worth it. My expectations have changed and my goal is simply to save as much as I can, rather than just get free stuff. My stockpile room has overflowing shelves and some of the foods I know I just will not get to before I decide I need to just toss it. As a former food scientist, I know that expiration dates are simply a suggestion and manufacturers use the date to rotate stock and try to ensure freshness. However, shelf stable products that have been stored at ambient temperature are good for many years, despite the expiration date. 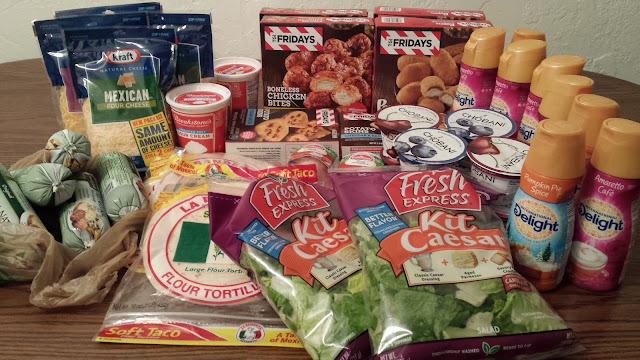 Anyway, I've been trying to scale back my stockpile and its really difficult. My three freezers are bursting and I have to pass many frozen foods deals because I don't have room. So, onto this shop. I think this is a good sale week so I stocked up on a lot of dairy products. The unique thing I noticed about my coupons this week is that they were all printables. I think that's a good thing, since here in Tampa we don't get the Red Plum in our Sunday papers and getting multiples takes a bit more work from gathering from friends and neighbors. The pork sausage rolls were a money maker with the raincheck from Thanksgiving time, and the International Delight creamer is a money maker. This helped offset the cost of the Kraft Cheese which is a good deal, but cheese is still expensive. I didn't read the TGIF coupon closely and the 1/1 mq from www.saveinstore.com is only good on 10oz or larger, so I had to pull out the $1.50/3 mq print from coupons.com that was good on any size to get the smaller potato skins snacks. I would have saved a couple more dollars by getting 6 larger size boxes and using all $1/1 mqs (it would have been $0.39 for all 6 boxes). I also didn't have any $5 off basket coupons, deciding against using the $10 off Visa coupon in the ad this week because they're a hassle to use. So, in the end my total was $8.74, and I saved 92% which was $106.39. 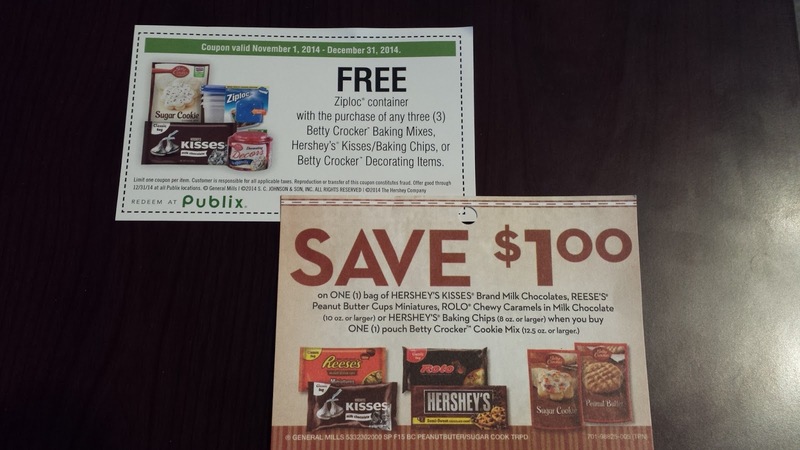 I paid using the $100 GC I won recently from a texting sweepstakes with Publix and Kelloggs. Well our shopping has changed since the end of Winn Dixie $5 off $30 coupons. 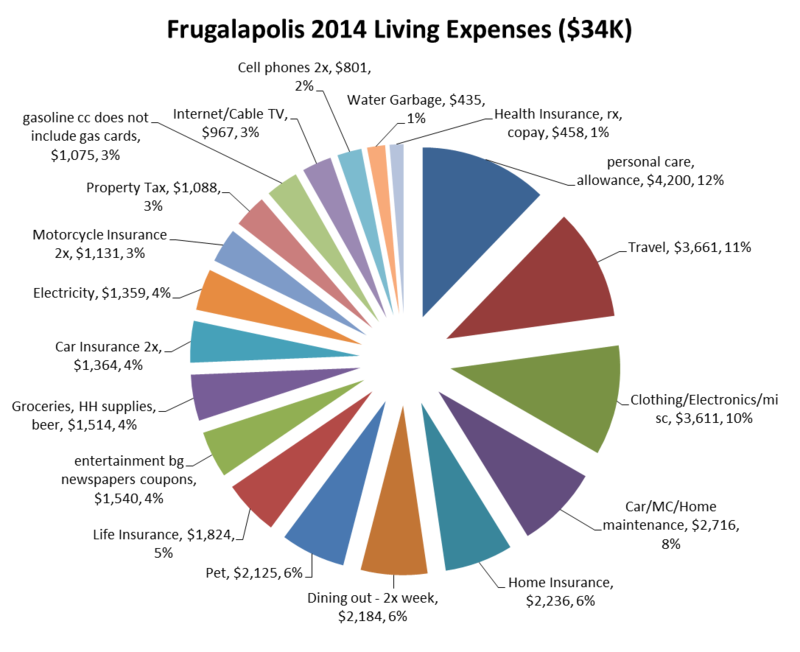 Occasionally there are other competitors or gas card deals ($10 off $50) or even Publix coupons in the paper, but generally we've been eating more off our stockpile. For our produce, which is expensive at Publix we shop at Save-A-Lot. We can get a 4 lb bag of navel oranges for $2.99, when the same 8 oranges at Publix would be more than double that. So, we go to the store a lot less; one trip to SaveALot and one trip to Publix. I also have to watch the ads for Winn Dixie and Aldi to see if there is any produce deal we need. It costs about $6 a week to get lettuce and stuff for our salads. This trip was about usual, spending a little more than $5. Our goal now this year is to spend $100 a month to feed the two of us. 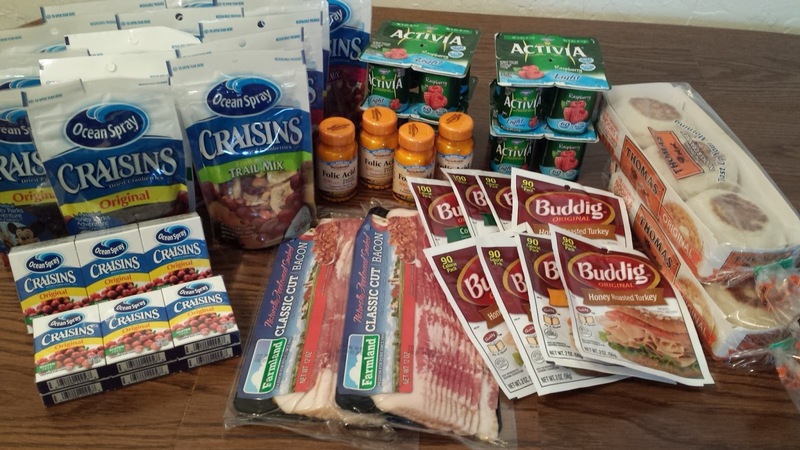 This trip was all coupon stuff, the craisins were free, and the vitamins and buddig meats were moneymakers. I did another similar shop with vitamin A which is cheaper than Folic, and the same basket of stuff cost me $2.48. The bacon was a good deal ($1 each) because we used the Publix coupon from last weekends paper for $2 off $8 of meat, and also some $2 off pork coupons we picked up at the state fair in the Florida Living Building at the Iowa Corn booth. In the end it cost $6, and we saved $78.35 - a 92% savings. Nothing says the ‘holidays are here’ quite like warm baked cookies! This year, throw a special minty treat into your cookie jar with seasonal Pillsbury Ready to Bake™ Peppermint Chocolate Chip Cookies. With a perfect mix of peppermint and chocolate these Pillsbury Ready to Bake™ Cookies are sure to be a holiday hit! In store for a limited time only, available at Publix. 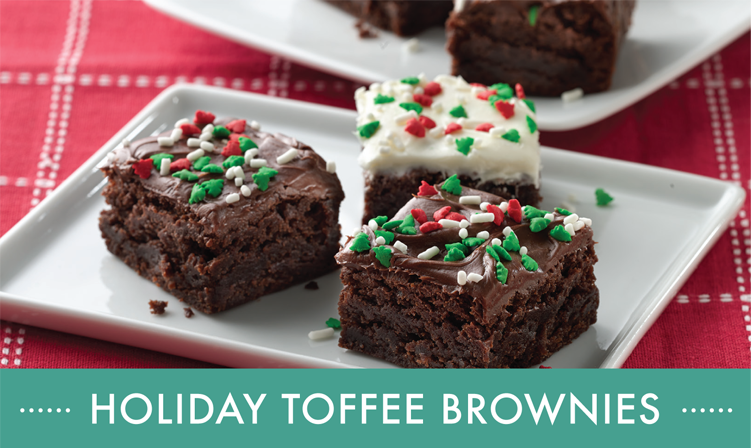 Need to plan for a bake sale, cookie exchange or holiday party? Pillsbury’s Quick Peanut Butter Blossoms recipe makes it quick and easy to bake up this holiday classic. 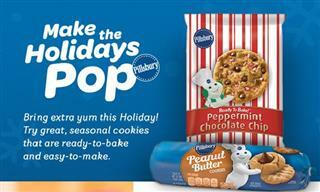 Be on the lookout for exclusive savings on Pillsbury refrigerated cookies starting December 4, available at Publix! No holiday party would be complete without a delicious party mix to munch on while sharing laughs and fun. 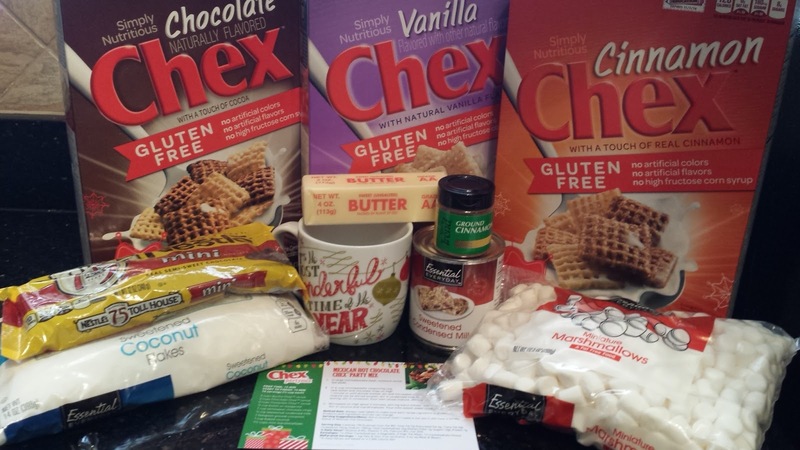 Fortunately, Chex makes it easy with over 100 Chex Party Mix recipes, including 50 gluten free recipes, with ingredients available at Publix. 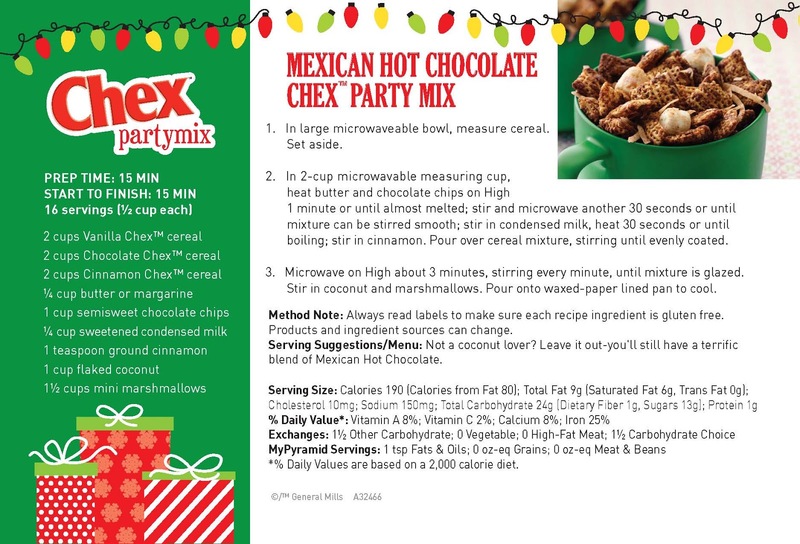 Visit http://chexpartymix.com/recipes to see all the recipes. 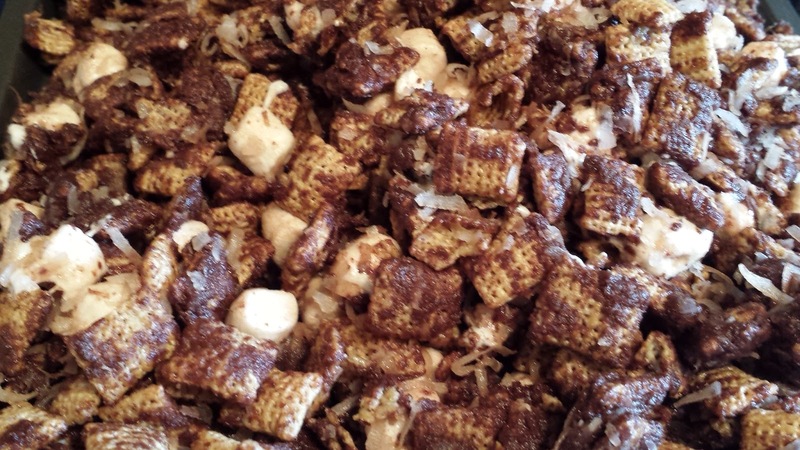 The recipe I made was the Mexican Hot Chocolate Chex Party Mix with cinnamon, chocolate, marshmallow and coconut, takes only 15 minutes to make and is sure to be a hit. Just measure the cereal, then melt the butter, chocolate chips in a separate bowl, add the sweetened condensed milk. Pour the chocolate sauce on the Chex mix while stirring and heating in the microwave. It is a crispy, sweet delicious snack. Be on the lookout for in-store savings and digital coupons on the www.ReadyPlanSave.com website, and share the following sales info with your fellow Publix shoppers! Chex Cereal $3.79 on BOGO from 11/20 – 11/26*, no coupon required for savings, available at Publix. *Dates might vary in certain markets. Baking season is here and the Betty Crocker Bake Center has everything you need to create delicious goodies for your family and friends. Find exclusive savings on essential baking mixes and ingredients from brands such as Betty Crocker, Hershey’s and Ziploc® brand containers, available at Publix. Looking for new baking recipes to delight your guests this season? The Bake Center display will feature four exclusive baking recipes as well as coupons; find the Bake Center at your local Publix. Here are the two coupons to get a great deal, and a scenario. Also may find the manufacturer tearpad coupon on thePublix display for $1 off Hershey products when you buy Betty Crocker cookies. It's another great week of sale items for your baking needs. 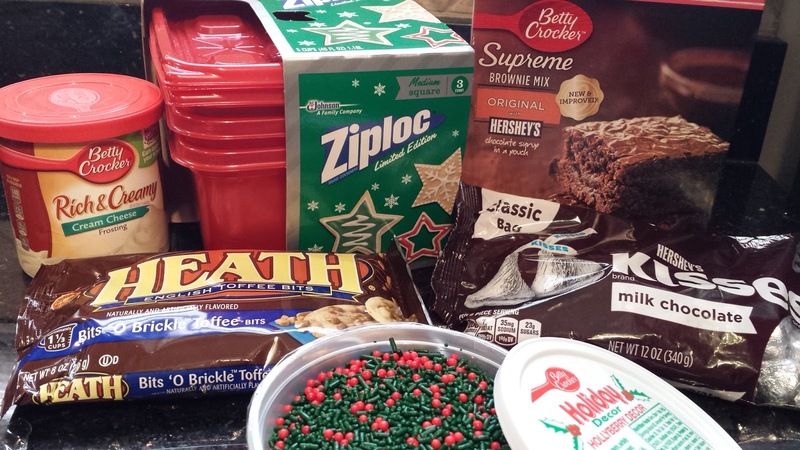 Last week we stocked up on cookie mixes, and this week it will be cake and brownie mixes. These brownies below are super easy to make and the cream cheese frosting is the perfect holiday touch to show of the green and red sprinkles.